Home › In it for the long run... › What is The Power of Running? What is The Power of Running, you ask? 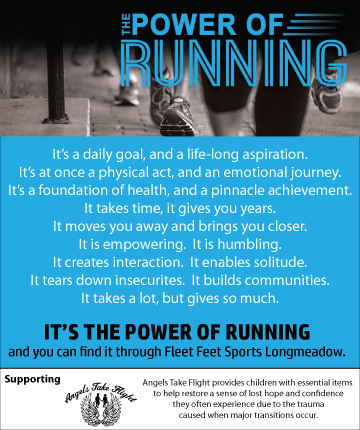 For nine weeks starting in August, we will donate proceeds from the sale of certain products as part of our Power Of Running For Good initiative to Angels Take Flight, a local organization that restores dignity, pride and positive self esteem in children in transition. PLEASE SUPPORT US AS WE SUPPORT OUR COMMUNITY. THE POWER OF RUNNING FOR GOOD...BE A PART OF IT!